I’m up very, very late. I laid down to take a nap sometime around 1:30, and mom didn’t wake me. I woke up at a few minutes to 6pm. YIKES! When I asked why she didn’t wake me she said she wanted me to get what rest I needed. I’m just happy I woke up before tomorrow (eeek, today) morning. I ate dinner, Daddy cooked hamburgers on the grill, packed up the car, and made it back to the good ol’ LBC by 9:30 pm. It took me a little over 2 hours to get home. Since Baby Girl had a nap in the car, getting her to sleep was near impossible and since I wanted to get her to sleep before I unloaded the car, I laid down with her in bed after taking care of the cats. We laid down around 10pm….she went to sleep around midnight. So I’ve gone out and brought in what I need for tomorrow, the rest can wait. I’ve moved a piece of furniture that I’ve wanted to move for a while now, so everything is ready for the baby corral to go back up when I get home with Baby Girl tomorrow. I should be in bed right now but A) I”m not tired at all, and B) the apartment smells of cat urine so I’m using this time to air it out, and C) I just need to write right now. I want to tell you all about someone that I love very much. No, surprisingly enough this is NOT about Rachel. I know, I know….you are all very shocked and surprised since she is pretty much all I talk about (deal with it). This blog is about my Grandma Coleman. She is dying, and will probably pass very soon. I’m betting Tuesday, but it could be tomorrow or at the end of the week. This is my grandmother, Geneva Coleman, born in Wasco, California September 14, 1920. Isn’t she beautiful? My mom told me about this picture this weekend after I asked her when it was taken. She didn’t know. No one knows. My Grandfather worked at the Air Force base near Wasco and met my grandmother at a church social, and he started to pursue her. I don’t know how long they had been dating or anything, it had to have been early on before they were an official couple of any kind, but Grandpa came back to the base one weekend after seeing Grandma and he is telling everyone about her and how in love he is when one of the men opens his locker and Grandpa sees this picture of Grandma hanging on the inside of the locker door. Grandpa confiscated the picture. We do know if wasn’t a professional picture, but mom thinks that one of her boyfriends took it. Grandma was chased by many men, apparently, and can you blame them? Grandma and Grandpa were married within a couple of years, I think. Mom was born to her when she was 25. She had 4 children: My Mom, Uncle T, Aunt CM, and Aunt CS. I’m learning that Grandma was pretty wild back in the day, and by wild I mean she could apparently drink beer, smoke a cigarette, and play the organ all at the same time. Don’t ask me how. Grandma loved to play the organ. I remember Christmases where we would gather around the organ and she would play and we would all sing Christmas Carols. It was a duty back then, something we kids had to do before we would be allowed to open presents. Sheer torture! When Grandma would baby sit me, she would let me play on the organ and I loved how it sounded so different than the piano, and I would push all the buttons (yes, it had buttons) to make the organ make different sounds while I played, and I would mess around with the pedals. I never was able to play the organ the way it was meant to be played. Grandma wasn’t the warmest of Grandma’s. She was raised Catholic and religion was everything to her. Mom said that Grandma used to make them say the rosary every night after dinner, for example. I know that Grandma used to hold me in her lap because I have pictures of me as an infant in her arms, but I also remember when I was older you never went up to her and crawled in her lap. Grandma wasn’t a touchy-feely affectionate kind of Grandma, but I never doubted that she loved me, she told me she loved me every time we said goodbye, and it was always accompanied by a hug and a kiss on the cheek. I never doubted that she loved any of us. Family was extremely important to her and she was always so happy when she was surrounded by all her children and grandchildren. If mom or any of my aunts and uncles ever needed her to help out with the kids, Grandma was on it. I wasn’t surprised to learn that Grandma wasn’t the warmest of mothers. Last week, my Uncle T came to say his goodbye to Grandma as she had stopped taking food or water, the signs that she is starting to die according to the nursing home/assisted living place. He went to see her Monday, July 23rd, and in one of her rare aware moments, she grabbed his arm and said, “I love you”. Uncle T told mom that was the first time he could remember her saying that to him. Grandma at my Uncle T’s wedding about 15 years ago. never showed her any love, and apparently it was obvious to all the saw them together from childhood to adulthood. I don’t know why this is, My Aunt CM is one of the sweetest and kindest people I know. I’m told she had a mouth on her as a child and had a bit of a temper, but that doesn’t make me understand anything. Aunt CM has lived her entire life trying to obtain Grandma’s approval and affection, and I can’t imagine how hard it must be for her that Grandma is dying and Aunt CM will never have gotten the approval that she has so longed for. She loves Grandma so much, and all she ever wanted was to know that she was loved in return. As I understand, those that are dying have a last spurt of energy in the hours before they go where they can communicate with people and even eat. I wish that Aunt CM could be there for that moment, and that Grandma would tell her that she loves her. I wish so much that would happen so My Aunt could have some peace. I can’t imagine that Grandma doesn’t love her, what Mother doesn’t love one child when she loves the others that she has? Grandma resents her for some reason, and it seems to have started with the pregnancy. I don’t think its Aunt CM that she is mad at, but either something was forced on her or she missed out on something because she was pregnant and has carried that grudge out on my poor Aunt CM ever since. Me, my brothers, and my cousins have nothing but good memories of my Grandmother for which I am happy. I do love her so very much. When Mom called me last week and told me Grandma was starting to die, I wasn’t surprised. She had started to decline this past year. She was diagnosed with breast cancer about 4 years ago and due to her Dementia and (I think) Alzheimer’s, her children got together and decided to let Grandma go untreated so she could live out her time comfortably. And Grandma has. I visited her almost every time I came to Bakersfield, and slowly she had less and less to say. She was always happy to see us whenever we came to visit, any of us. One day, a couple of years ago, Mom said that Grandma may not recognize me when we went to visit. I wasn’t looking forward to that but, ok. When we went and got Grandma and were wheeling her down the hallway to go outside, she looked at me and said, “Its about time you came to visit!” That still makes me smile. That was one of the last times she knew who I was. I think it was that visit that I asked Grandma if she wanted me to smuggle in a bag full of Snickers for her (she LOVES Snickers) while we were sitting in the sitting area that is in front of the entrance to the Assisted Living place , and she leaned forward in her wheelchair and said, “You know, I’d really like some wine.” I told her I’d see what I could do, but I knew the next time she saw me she would have long forgotten about the request. Grandma was a functioning alcoholic, and the home allowed her only two glasses of wine a day. This did not please Grandma. The only good thing that came out of her Alzheimer’s/Dementia is that she eventually forgot she was an alcoholic. I kept visiting her even when she had forgotten who I was, but when I had been wiped clean from her memory I couldn’t go visit her by myself anymore, I had to go with mom. The last time I had visited her by myself I had felt so bad because she seemed a little frightened. Who was this stranger in her room? I had even taken mom’s dog, Winnie, because mom said she would remember Winnie. She didn’t. She didn’t remember Winnie and she didn’t remember me. I was sad, but I had been expecting this day. In the visits afterwards I went with mom. Mom would introduce me as her daughter and that would spark a memory with Grandma and sometimes she would remember me, and sometimes she wouldn’t. She always said she remembered me, but you could tell by the look in her eyes whether or not that spark of recognition was really there. The last handful of times I went to visit her, there was no spark. I went up to Bakersfield this weekend to say my goodbyes to Grandma, and to tell her I love her. I wasn’t worried about seeing her or anything because I’ve always dealt well with death by natural causes. I understand that everyone dies, and always have. Death has never bothered me even when I was little, only tragic death has ever bothered me. Anyone that dies before a ripe old age by accident or illness has upset me. Seeing Grandma was harder than I thought it would be. Like I said, I’ve always dealt well with death….apparently the act of dying disturbs me. When I went into her room Saturday around noon, with Mom, Aunt CS, and my cousin C, Grandma was in bed and she just looked like she was sleeping. Grandma was petite, but her presence always made her seem much taller than she really was, yet in her bed she looked exactly like what Mom said, a little bird. She was curled up on her side, her chin tucked in towards her chest. She was breathing evenly, almost deeply, and even sounded like she was asleep (I even think I heard her snore a little). I wanted to crawl into bed and cuddle her, hold her, she looked so fragile and small. I just stood there at her bedside and looked at her after I said “Hi Grandma, its Katie,” and I kept expecting her eyes to open and her to say something. Mom had told me her eyes had glassed over on Wednesday (maybe it was Thursday) and that Grandma had fully retreated into herself….but I wanted to shake her and say, “Wake up Grandma, we’re here!” Don’t worry, I didn’t. We all stayed for a while and visited in Grandma’s sitting room while each one of us took a turn having a visit with Grandma. When it was time to say goodbye I went over to her and petted her hair and gave her a kiss on the forehead and told her that I love her, and as I walked out of the room I called back to her that I would see her tomorrow. Tomorrow is today (was today, as it is now 2:01am Monday morning). 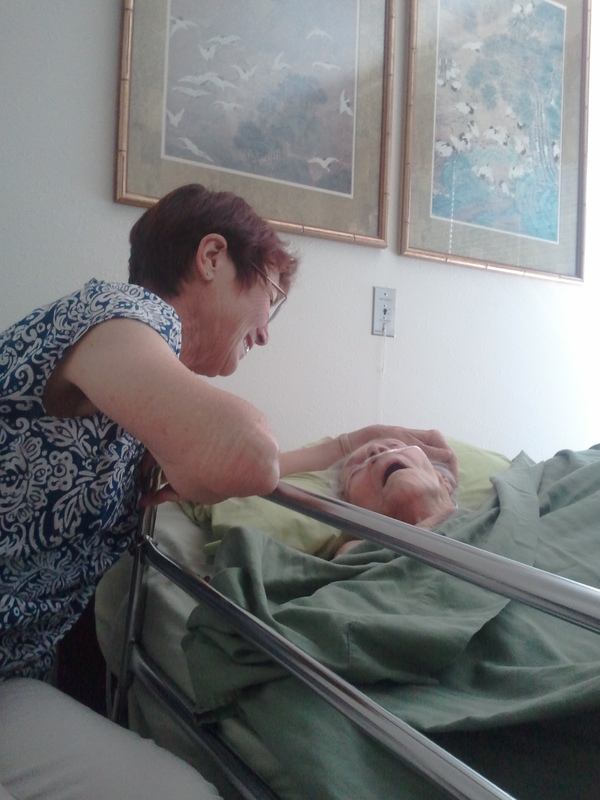 Me and mom went to visit Grandma and we kissed her forehead and said hello and then we stayed and visited for a while. Mom likes to stay in case Grandma wakes up. Grandma had a couple of episodes while we were there, little mini-seizures. Her head and body would shake slightly and then it seemed like she’d stop breathing for a little while. Mom and I would hold our breaths until we saw her breathe again. Well, I know I was holding MY breath, mom is dealing with all of this better than I am, but then mom has been visiting Grandma almost everyday since Grandma went to the home. Mom knows Grandma will be at peace when she passes, and Grandma certainly looked peaceful today. Grandma had been changed out of the green nightgown she had been wearing yesterday into a pretty red one. She was on her right side today (the staff turns her regularly) and her head was back and her mouth was open. She was still sleeping, but when I sat down it seemed that one eye opened slightly (the other eye was a little crusty and didn’t look like it could open if she wanted to open it). I understood then what the glassed over look was. It was kind of creepy, her eye was moving and yet I knew she couldn’t see me. She was still looking within herself, within her mind, and her eyes looked like a film was over them. Her eye color looked….muted. I switched places with mom so she could tell Grandma that she was there and say hello and talk to her a bit. We both sat next to her bedside while mom told Grandma the news of the day, and the scene was so touching to me that I had to take a picture. I know, even I felt uncomfortable taking a picture of my Grandma while she lay dying, but it really was such a sweet scene. Grandma would clobber me (she was always very attentive to her appearance), and she would clobber me again for putting a picture of her up on the internet looking less then picture ready, but to me she’s still beautiful. One of the CAs came in to check on her while we were there and she said that Grandma has her head back now, maybe so its easier to breathe. She checked for urine and Grandma was dry. This was her first day with no urine output. Her body has no more water to rid itself of. All I could think is, Uh oh…it must be soon. It was hard visiting Grandma. While I was sitting there and our visit was drawing to a close, the only thing I could think of is that the next time I saw my beautiful Grandma, she’d be in a coffin. I didn’t want to leave. I didn’t want to say goodbye yet, so I went to her dresser and got her brush and brushed her hair. The nurse came in and gave her medicine because it was time to turn her over and it is very painful for Grandma when they do that. The CA said that she opens her eyes and you can tell that she is in pain. Mom said it was time to go after Grandma got her medicine. I went and kissed her on her forehead and told her I loved her one last time. I think Mom didn’t want me to see Grandma in pain, and as much as I wanted to see her open her eyes and be aware, I didn’t want to see her in pain. I didn’t protest when she got ready to go and I followed her out the door. So now I wait for the call that Grandma has passed. I do hope that Mom or Aunt CM or some family member is there for the last surge of energy before she goes. I hope her last moments are with people who love her. I wish I could be one of them so I could tell her one last time how much I love her, but I can’t be, so I’ll see her again at her funeral. This entry was posted in Death, Family, grief, Memories and tagged childhood, death, dying, family, funerals, Grandma, grief, love, memories, mourning, parent, passing. Bookmark the permalink.